Tiga has always been known for his strange lyrics and catchy dance tracks. The head man in charge of the amazing Turbo Records, he's a become a legend in his years as a chart-topping DJ. How can anyone forget the perfection that was "Shoes," or his interesting take on "Hot in Herre?" He's recently been making a big comeback, releasing compilation albums, and returning to the style that made so him iconic back in the day. What came out was "Let's Go Dancing," which put efforts from Matthew Dear, also known as Audion. 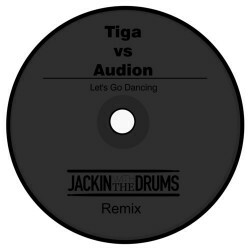 The eclectic dance song was bound to catch attention, and official remixes have already been released by the likes of Maya Janes Coles and Breach, among others. However, we at EARMILK don't only look at official releases, and we've found one by up and coming Belgian trio Jackin with Drums. The producers have been slowly attracting attention in the techno scene lately, and this remix highlights why. Taking the already spectacular original, the boys hit harder and darker in their version of the song. It'll certainly be played at a much different party than what the original track would be played at, but a little dirty 4×4 dance song has never stopped us before. They've recently released their EP, which is out via Beatport. We also found a cool mix they've done, also posted below for your hearing pleasure.